"You've been given a great gift, George." What is there to say that hasn't already been said about It's a Wonderful Life? Not much, I'm guessing. It is certainly a wonderfully ageless American film, with a tale that never ceases to bring a tear to the eye, and thanks to its brief life in the public domain, became a perennial holiday classic. Maybe it's just me, but the older I get it seems the more weepy I get each time I watch this film, and as George Bailey sees his life spinning out of control, there is that painful flicker of familiarity in which in some perfectly cinematic moment we can almost see ourselves standing on that very same bridge, ready to jump. Not to start another paragraph with a question, but what is the likelihood that someone reading this review has never seen It's a Wonderful Life? Probably about as unlikely as the possibility of coming up with something new to say about it. Director Frank Capra landed American cinema's favorite Everyman in the lead, Jimmy Stewart, as George Bailey, a man living out his life in apparent bliss with wife Mary (Donna Reed) in the picture perfect Rockwellian splendor of Bedford Falls. It's when a series of events at Christmas lead him to question why he had ever been born that a bumbling guardian angel named Clarence (Henry Travers) just so happens to give George the opportunity to find out, and along the way he (and we) learn a valuable lesson that beautifully leads to one of filmdom's most surefire guaranteed-to-make-you-weepy payoffs of all time. Capra really tweaks all available emotional knobs here, just like a master puppeteer, and the injection of simple humor and bitter drama really meshes well, even after repeated viewings. Dastardly Lionel Barrymore as the iron-fisted Mr. Potter, a real-life Montgomery Burns if there ever was, pops up as the much needed heavy from time to time, but the catalyst of tragedy comes most markedly from the actions of forgetful old Uncle Billy (Thomas Mitchell). Watching Stewart's largely likeable George Bailey slowly reach the end of his rope is a tough watch at times, even knowing the outcome, and this is where Capra balances between comedy and pathos so deftly. We have to cringe when once happy George suddenly rips into his children, the piano playing, the broken banister cap, and his wild-eyed desperation and hopelessness dramatically alters the tone of the film, and we know we are more than hooked at that point. We are weeping, emotional wrecks well on the way to a good cry. 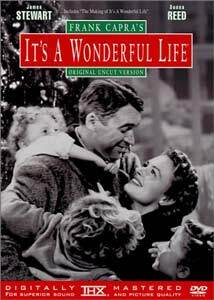 All of the stories about how It's a Wonderful Life was or wasn't a huge success when it was released is really a moot point, as far as I'm concerned. This is simply a great film, and this Artisan reissue, in all of its digitally re-mastered and THX glory, only makes it that much greater. To a slew of generations, it has become a part of popular seasonal culture, and I suspect that director Frank Capra would take great satisfaction in the longevity the film has enjoyed, even over the five Oscar® nominations it received. This is an outstanding film, and this first-rate Artisan release belongs on every shelf of every movie fan. Bar none. Image Transfer Review: In terms of image quality, this is certainly the definitive version of It's A Wonderful Life. Presented in 1.33:1 OAR, it has been digitally re-mastered from the original film negative, and the end result is pretty impressive. For starters, source print flaws and scratches are minimal, practically nonexistent, which for a film this old is praiseworthy on its own. Then we get to the picture quality, with its exemplary contrast levels that reveal the blacks, whites, and greys that will likely make you sit up and take notice, especially if you've only been used to seeing this on television. Audio Transfer Review: One would think that there's only so much you can do to an audio track from a 1946 feature, but the THX mastered mono audio on this title, at the very least, shows much things can be improved. The crispness and fullness of the dialogue track is a marked step up from the numerous public domain issues of this film, and while it won't give your system a work out, it is a consistently solid track. The hiss and crackle so predominant on lesser issues has been nearly eliminated, and the overall presentation is remarkably clean. French and Spanish mono are also available. Extras Review: Side B is where the extras are housed, and I never thought I'd say the words "Tom Bosley" and "great documentary" in the same breath, but this issue of the Capra classic has just that. The 1990 Making of It's A Wonderful Life (22m:41s) is narrated by Bosley, decked out in a really tight sweater as he stands awkwardly next to a fireplace, but it's the content that really makes this a treat. From the story's origins to its eventual production, James Stewart, Frank Capra, and Sheldon Leonard contribute remembrances, but it is the little production anecdotes and random factoids (like pointing out Carl "Alfalfa" Switzer's cameo) that make this a pleasant and informative feature. A Personal Remembrance (14m:05s) is a 1991 featurette narrated by Frank Capra Jr., and it includes what was likely the last interview with the senior Capra prior to his death. Obviously this piece is a bit more heartfelt, and naturally more personal (hence the title), and hearing Capra himself recall the production is wonderful. There is also the original 1946 theatrical trailer, in addition to the usual THX optimizer. The disc itself is cut into 28 chapters, and includes subtitles in English, French, and Spanish. You don't own this? Shame on you!